Police confiscated the counterfeit goods and all manufacturing equipment at the Mobeni factory. 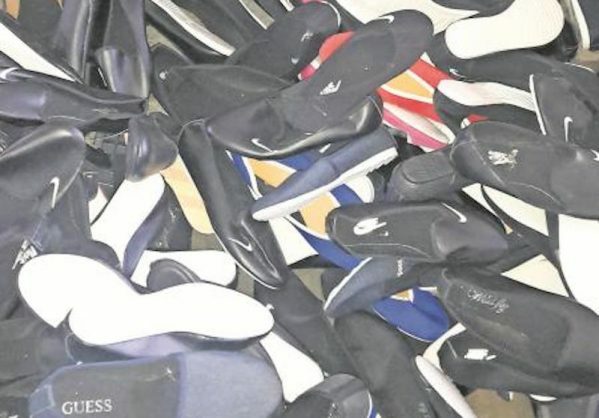 Fake Nike and Guess branded items worth R5 million were seized after a joint police operation shut down a Mobeni factory, in the south of Durban, on Thursday, reports the Southlands Sun. Members of the Hawks counterfeit team, ORS Durban Harbour anti-smuggling unit and border security crime intelligence, made the discovery of the counterfeit factory that was manufacturing the fake products. Among the counterfeit branded items were sandals and shoes. A Nike protection manager was on scene to identify the label’s brand. Police confiscated the counterfeit goods and all manufacturing equipment. “The owner of the company will be summoned to appear in the Durban specialised commercial court to face charges of contravention of the Counterfeit Goods Act 37 of 1997,” said Hawks spokesperson Captain Simphiwe Mhlongo. Machines were confiscated during the operation. Picture: Southlands Sun.